Pick your 12 by 12 inch cardstock. Cut it into four 6-inch squares. Set aside two of those squares to make two envelopes. Take one 6-inch square and cut it into two 3-by-6-inch strips. Once folded in half, these are your 3-inch square cards. You will be layering and embellishing these cards to your heart's content! Back to the envelopes . . . If you have a Helix Craft Room Envelope Maker, you don't require the template. 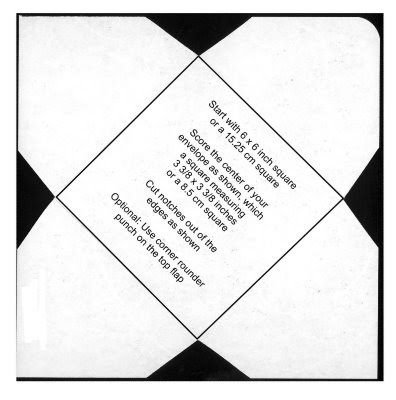 All you need to do is line up the 6-inch square of paper on Line 3 and score the four sides. You will cut the notches where the lines cross. If you don't have a Helix Craft Room envelope maker, I have created a template that you can download and print. It is available by clicking here. I have included two templates in the Adobe pdf file above. One includes the dimensions of the envelope and the other is blank. You can take the blank one and print it directly onto your cardstock, cut out the notches, trim off any black edges, and score on the lines (which will not show when the card is folded). You can see a sample of the template below. This photo will not print to the correct size, so please use the pdf link above to acquire the template. Once you print out the template, cut out the black notches and trim off the black edges. Now you can lay the template over your 6-inch square cardstock and trace the notches and then cut them out. It will become obvious how to fold the envelope once you’ve trimmed the notches. I’ve used a corner rounder on the top flap to make it look neater. You will need to glue down the other three flaps – just like folding a diaper. LOL! The Art Institute’s Art Glue works great for this or any strong double-sided tape. You can use envelope glue (such as Lick and Stick) on the top flap. Or leave it without glue. Here are other cards and envelopes that I made. They have yet to be embellished. Wonderful tutorial. Will have a go. Thanks again.